Eliza Jones: This is not from our area, because I’m from Koyukuk River on the middle Yukon and this looks different. But in our language this is called kk’eeyh tl’ok, which means “birchbark dish,” and they were also called too tl’ok “water container.”(2) And when I was a child, when we went berry picking, all the families had kk’eeyh like this to pick berries in it. What do you know about it Judy? Judy Woods: We call it kk’eesh tl’och [birchbark basket], and we used to fix them up like this too for water. One time we traveled, and my mother made little ones because we left our plates and stuff down by the river. We used to make little bowls like this for us, for our soup. They used these to pick berries, and they made a bigger size. For kids they made them small. This [rim] is made out of . . .
Eliza Jones: I think this part [rim] is roots. Eliza Jones: But I don’t know about this black part [woven into top of rim]. Do you think that’s quills? Judy Woods: Quills, because they used to dye them. Eliza Jones: Okay, so that’s trimmed with quills, but these strings right here [along rim] are roots. I know around home we use spruce roots, but I don’t know if this is willow or spruce roots. Judy Woods: The basket is made from birch. Eliza Jones: Yes. This [side seam] looks like roots too, right? Eliza Jones: And sewed with roots. Trimble Gilbert: Where I grew up, we didn’t have birch. There’s hardly any there. So I don’t know much about this, but then I know up on Yukon a lot of people used to make this kind. That same material, they used it for canoes on the Yukon Flats. K’ii tr’ih rii giiyàhnyaa [they just call it birchbark canoe]. And jìi khaii reh [this one roots], roots. Different kind of roots—spruce roots and willow roots where the bank is getting erosion. Eliza Jones: Yes, where there’s erosion and there’s roots hanging down, that’s an easy place for people to pick from. In my language root is called huyh. How about yours? Trimble Gilbert: Khaii [roots]. Ts’iivii khaii rii giiyàhnyaa [they just call it spruce tree roots], spruce. K’aii khaii chan [and willow roots too], willow. It’s good material. I know that this [along rim] is the roots that we used to tie the caribou fence too. When they made a caribou fence they didn’t have rope, so they tied it to the trees with roots. It was a long time ago, but that material is still hanging on. Phillip Arrow: I know lots about this. My mother used to make this quite a bit. She didn’t make it this fancy though. She got xuyh [roots] that came down the bank. She put that around here [sides] and used for this [rim] willow, tr’itl. When she wanted to make it fancy, she put that that kind of xuyh on. And I’ve seen lots of this birch bark. They call it q’iyh [birch bark]. Eliza Jones: They pick roots at a certain time of the spring, right? Phillip Arrow: Right, when it’s getting green. Eliza Jones: Yes, when it starts getting sap, then it’s easy to pick. NMNH staff: Is there processing done on the roots? Judy Woods: Just in the water. Peel the bark off. Eliza Jones: You have to split it, and then you smooth it out. Trimble Gilbert: That root is different too. You’re out there just looking for the best ones. Judy Woods: Mm-hmm. My mom used to say when you see spruce trees, when the branches are like this [curved], she said that’s when they get it. That’s what my mom used to tell me. My mom used to make a lot of baskets. Eliza Jones: And you were talking about certain kind of willows that they use? I think it’s the red willows, the narrow leaf willows. You find them on the Yukon River. Right now that kind of willow is hard to find on the Koyukuk River they said because of the moose moving into the area and eating it. And so people who work on the Koyukuk River, when they come to the Yukon, they’re always happy to see the red willows. Eliza Jones: This is called benoghe’ [its eyes], these horizontal lines [on sides]. And when they’re picking birch, they look at the lines. And I think Grandma said—this is my husband’s grandmother—she said that they look for short horizontal lines, that’s the sign that it’s a good tree. The ones with the short eyes are good birch bark. Judy Woods: Mm-hmm, good to work with. This you could fold it up. Eliza Jones: Some birch bark, you know, you peel it and it’s not limber, it can crack easier. And then as you’re looking at the trees, there’s a front and a back. And then the back, they look at it and it’s called benene’ [its backbone]. So you want to cut it on the opposite side, on the underbelly side. I don’t know if it has to do with where the sun is hitting or what, but I know that that’s what they said. So when they’re looking for good birch bark—maybe not even so much for a birchbark basket but for making canoes—it has to be really good bark. And also if a tree is standing kind of by itself, it’s a healthier tree. Suzi Jones: What kind of a tool do you use to take the bark off the tree? Judy Woods: They have a knife and a stick, I guess. And they make like a . . .
Eliza Jones: Wedge. You put it in, and you go [downward zigzag motion] so that it comes off evenly, all the way down. Aron Crowell: Are there some trees that are recognized as good that you come back in another year to get the same tree? Eliza Jones: Oh no, you can’t. Once you take the bark from a tree, you don’t pick the same bark again. I think it was spruce that was peeled and then regrew. They said that they used to peel those and use those on their fish cutting tables because it has that rough surface, so the fish don’t slide around on it. Judy Woods: Then for spruce too, they used to take some bark off and put that on top of smoke houses. Suzi Jones: So do they make their baskets very soon after they take bark off the tree, while it’s still soft? Eliza Jones: You can keep it a certain amount of time, and they roll it up and keep it in a cool place until they’re ready to use it. And then when you’re ready to use it, when you’re ready to make these corners right here, traditionally, you hold it near the heat. And that heat softens up the bark so that it can fold and bend without cracking around here [corners]. Suzi Jones: Do they use any sort of tools in making the basket? Eliza Jones: There’s an awl that they use. They punch the hole, and then they put the—of course you have to have all your roots and willows all ready. Judy Woods: We put our roots and stuff in water. Eliza Jones: Yes, to keep it moist. Trimble Gilbert: If we don’t know the [right] kind of material, then we’ll just waste time doing it. It takes a lot of time. Like a birch, there’s a lot of them, but the old people usually look at best one. They just look at it. And sometimes they hit it with a knife or axe and then tear it, and they chew it too. I don’t know how they know that it’s easy to bend it more and good material. You have to use the right material to do that [basket]—all of these. Many of us don’t know a lot about it yet. Eliza Jones: I know my Uncle Chief Henry used to make a lot of snowshoes on the Koyukuk River, and he used to say that they walked around in the woods and looked and looked and looked. And then they come to see a birch where the trees are not so dense. He said they stand on one side and look up at it, they turn and keep walking around it. I don’t know exactly what they’re looking for. He said that sometimes without even peeling a chip in it, you could tell which one is good by looking at it from all sides. Suzi Jones: I read that they looked for very straight trees, so the grain would be straight and wouldn’t twist. Eliza Jones: Yes, that’s for snowshoes and sled making. Judy Woods: Then they could bend it easily. Trimble Gilbert: Yes. Some go [looking] right by the water and some at higher altitude in high hills, and they talk about it. I think [wood from] up in the hill is easier to work with. Eliza Jones: That’s what I think. Trimble Gilbert: George Attla, he said something about birch. He used to make sleds. He said there’s a lot of birch all over, but he’s looking for the best one, maybe for one whole day. You just can’t go out and pick anything. Judy Woods: Mm-hmm, that’s what they always want, the older men to teach the younger kids how once they get good birch, they’ll always get good birch. And if they get bum birch right at the beginning, that’s just like bad luck you know. 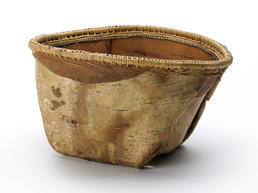 This Koyukon or Gwich’in basket is made of folded birch bark, with a single wooden hoop to reinforce the rim. It is stitched around the top with split spruce roots and black-dyed porcupine quills tucked in around the rim. Although birch bark baskets are no longer used for everyday storage and cooking, many contemporary Athabascan artists produce them as gifts or for sale, using traditional techniques that are similar across the entire region. (4) Bark is peeled in the spring or early summer when it comes off most easily, taking only the outer layer so the tree will not be killed. The bark is cut, warmed to make it flexible, folded into shape, and stitched together with split spruce or willow roots, using an awl to make the holes. To add color to the basket, the stitching roots can be dyed with blueberries (gray-blue), rhubarb (green), or alder (red). Rims and reinforcing strips are made of red willow or cranberry wood. Other decorative materials such as splints of cranberry wood, stems of the mouse berry plant, or porcupine quills can be worked into the design.